I have been uncharacteristically quiet for the last three days, and for good reason; I have been hard at work signing off our range for next Christmas. If I had a pound for every exclamation of surprise I heard on passing our review room, brimming over with trees, lights and sparkly trims, I would be able to retire to the Bahamas on a handsome pension. Best of all was the unsuspecting window cleaner, who winched himself down the side of the building only to be confronted by Santa’s grotto. Meanwhile spring is definitely just around the corner and the early mornings are giving me great pleasure. I’m able to get out in the garden for an inspection before leaving for work. I can at last appreciate the first primroses, pulmonarias and, surprisingly, Schizostylis putting on a great show of blush-pink flowers. The weeds are also getting into their stride and will quickly take advantage if not tackled quickly. 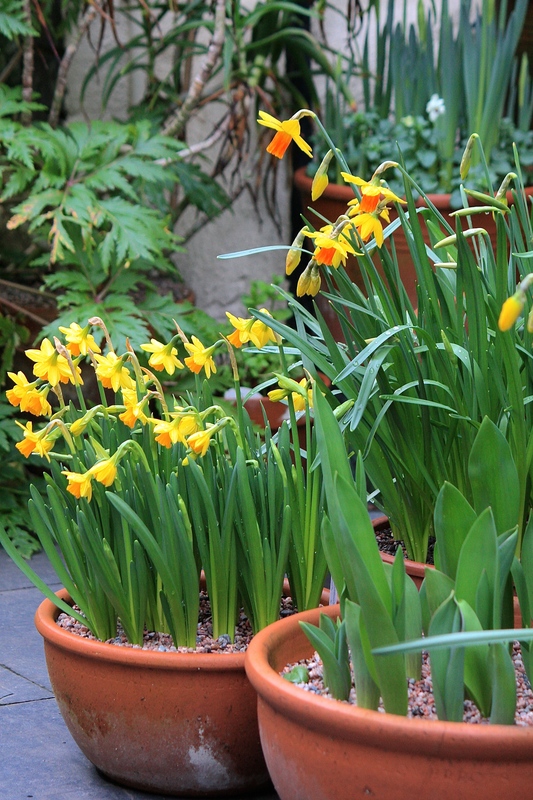 In Broadstairs pots of Narcissus ‘Tête-à-tête’ and N. ‘Jetfire’ have already cast their sunny spell over the weather-beaten garden. The star of the show right now is Crocus chrysanthus ‘Lady Killer’, a variety I have been meaning to grow for many years. It is an absolute charmer, with outer petals feathered royal purple, wrapped around saffron-yellow stamens. I placed a pot of Iris reticulata ‘J.S. 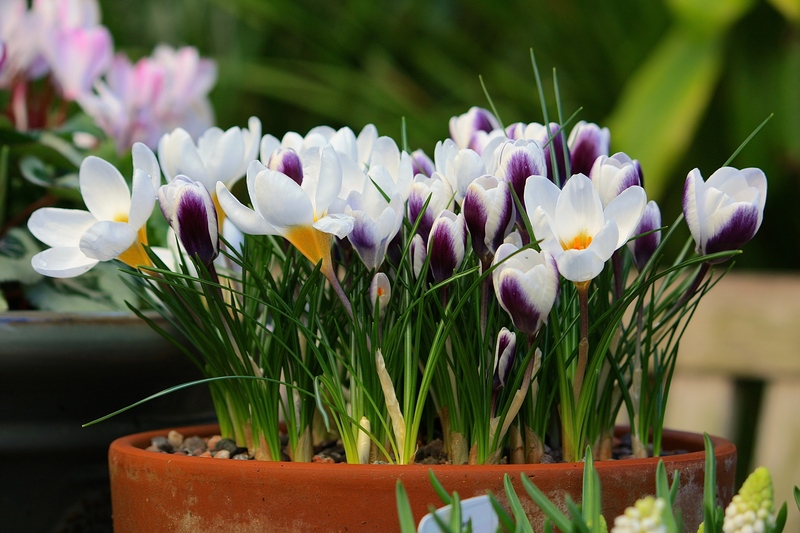 Dijt’ nearby; the rich colour and flowering time has proved to be a perfect match for the little crocus, so next year I will combine them together in one container. The weekend promises sunshine and temperatures in the high teens. I can now dust off the glitter, leave Christmas behind and look forward to the joys of spring. It should be a wonderful weekend for gardening; for planting seeds and starting off the dahlias and begonias. They only seem to have been packed away for a couple of months, but already I can see the begonia tubers sprouting without encouragement. It’s the same story with the fuchsias, which I cut back in November and squirrelled away in the cupboards of our outdoor kitchen. A frost now would be catastrophic, so I will take care not to get carried away and expose them to too much cold. With such marvellous weather forecast, what garden tasks are you hoping to complete this weekend? Oh these pots are stunning. Am just about to start potting up all my daffs and tulips and am hoping the 500 king Alfred’s I planted three floats in the paddock last year have naturalised and I have a wonderful show in July. Have to keep,the alpacas put of this area once they start to show, as the little monsters will be in to them for a tasty treat…not good for the bulbs or the health of the alpacas. Keep sending the pot pics, they make me feel so cheerful and happy every time I see them. Thank you Santa!